Equine therapy is a type of animal-assisted therapy that involves an animal as a form of treatment. By interacting with a horse or pony, patients can work on specific emotional issues that they might have a difficult time addressing through conventional therapy. 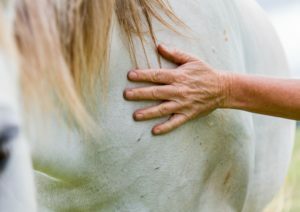 As such, when doctors combine equine therapy with the standard treatment plan for addiction they can help patients learn how to cope with stressful situations and improve their self-esteem. The therapeutic impact of equine therapy has been recognized since as early as 1969 when the North American Riding for the Handicapped Association (NARHA) discovered its benefits for people with disabilities. But the applicability of horse-assisted learning and equine-assisted psychotherapy extends beyond the physical benefits. Equine therapy has been shown to improve patients’ cognitive, emotional, and social functions. As such, more and more rehab facilities are beginning to implement this form of alternative therapy to help patients acquire the tools they need to maintain the positive outcomes of treatment even after they check out of the facility. Although some are still skeptic about the benefits of equine therapy, more and more clinicians are becoming aware of the impact spending time with an animal can have on patients’ well being. Not only that, but this type of therapy can also help the therapist assess the emotions and feelings of difficult patients. Horses tend to mimic the emotions of the person they are interacting with. For example, if a patient is anxious, the animal will react and behave accordingly, even though the person may be very apt at hiding his feelings from other people. Equine therapy can also help patients understand how interpersonal dynamics work and achieve the tools they need to navigate them with ease. Empirical evidence shows that equine therapy can be highly beneficial, especially when paired with other conventional forms of treatment, such as individual or group sessions. The therapist can use interaction with horses as a way to open a meaningful conversation about a patient’s struggles, emotions, and concerns. What Other Animals Are Used in Treatment Therapy? When the therapy session also involves a pet, whether it’s a horse, cat, dog, rabbit or sheep, patients tend to feel less threatened by the treatment. That can make them more willing to open up and dive deep into the emotional issues that may have led to the addiction in the first place. Equine therapy allows building a safe environment for people that feel uncomfortable in a traditional setting. As a result, this type of therapy can be highly beneficial in dealing with difficult patients that have poor social integration skills or low self-esteem. Addiction is a particularly stubborn illness to treat. Windward Way realizes how hard it may be for you or for someone you love. But because we not only use traditional addiction treatment methods but also newer, more innovative techniques like Equine Therapy, our addiction treatment program can dig at the roots of a man’s fight with alcohol or drugs. It’s important to realize that Equine Therapy does not equal “riding” a horse. Instead, the aim is for the client to develop a working relationship between them—a natural predator— and a prey animal. The horse can help a man learn about himself and what “makes him tick.” The therapy often helps establish healthier living routines that promote a vigorous, long-term recovery. Many of our alumni report back to us, telling us that they loved their experiences in equine therapy and how it helped them learn about themselves. Linked with other modalities for addiction treatment like Tai Chi, this therapy can become a powerful ally to produce a recovery that lasts. We can answer the questions that you may have about equine therapy or any other of the many therapies we use to help you get your life back. Rediscover yourself, the Windward Way. We can individualize a program that fits . . . just for you. Call our pros; we’re here 24/7: 855-491-7694.